– this is as far south as you can get in Sweden! 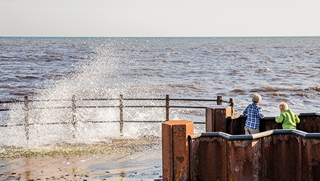 Enjoy the sun, breeze and salty sea splashes against your cheek. Experience the feeling of freedom when you gaze out towards the unbroken horizon. Pay a visit in autumn when blazing sunsets take your breath away. Or see how the winter magic takes over and transforms parts of Smygehuk to an artwork of ice and snow. Follow the seasons on the southern tip of Sweden. Well worth a visit year round! East of the harbour there is a coign of vantage that marks the exact spot of Sweden’s southernmost point. A compass card etched into the paving stones shows the distances to various international destinations. The Merchant’s Store was built at the beginning of the 19th century and was one of four trading posts in the vicinity of Smyge harbour. Rumour has it that the store was used as a smugglers’ den during the Napoleonic war. Even today the store is a constant reminder of the hey-days of the maritime era but in modern times the store houses art and handicraft exhibitions and a café. It is rumoured that the American actress Uma Thurman’s grandmother modelled for Axel Ebbe’s sculpture Famntaget. 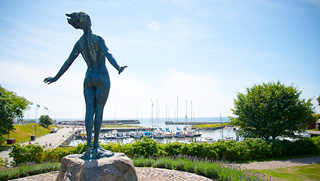 Famntaget is located in the harbour of Smygehuk, where with her hair swaying in the wind and her face turned towards the warming sun she embraces the sea and lets the fresh sea air fill her lungs. Limestone has been quarried in the area of Smygehamn for many a year and the countryside still shows traces of the quarrying. Industrial limestone quarrying and burning probably began around 1860. The operations were phased out in 1954 due to poor profitability. 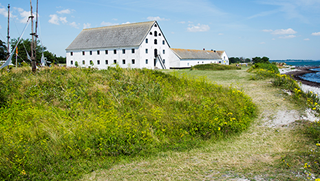 The limestone was used for mortar and render, to white-wash houses and even during sugar production. The burning was done in the so-called dome-shaped kilns for periodic operations. In total 10 kilns were in operation. Nine of the kilns have been preserved, the oldest of these is from the mid 19th century, built by German, Herman Wendt it lies between the harbour and the Merchant’s Store. 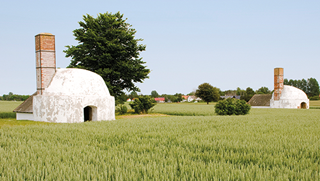 The remaining kilns can be found to the north of Smygehamn. The area around the harbour has been inhabited since times immemorial. 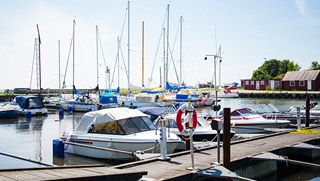 The small fishing hamlet that gave rise to Smygehamn has existed here since the 17th century. Smyge fishing hamlet was first inhabited in 1877 by 16 fishermen. In 1962, there were about 35 fishermen plying their trade in seven large boats from Smyge. The harbour, built in the 1920s, was originally a limestone quarry. Now it is one of the 3 marinas in the municipality. Previously, the ships anchored off the coast, and were loaded and unloaded by barges from the long stone jetties. To the west of the harbour you can find small fishing huts or ’Hodder’, as they are called here, where the fishermen keep their nets. There is also a popular smokehouse here. Natural plant and animal life around the headland is characterised by the calcareous land. On the beach, there are a multitude of smooth stones, washed up from the calcareous bedrock. You can also find fossils, which are petrified remains of sea urchins that lived almost 100 million years ago. Plants that thrive in the calcareous soil are the species Burnet Saxifrage, Greater Knapweed and Armeria Maritima. North of the harbour is marshland where the Western Marsh Orchid and Early Marsh Orchid thrive. In the marshes you can find newts, frogs and toads as well as the heavily endangered sea toad. 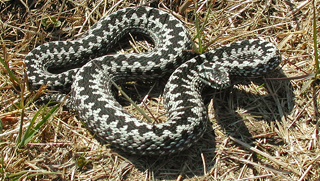 In the coastal meadows between Böste and Smyge harbour there is a unique population of vipers, probably the only remaining ones along the south coast of Scania. Vipers are a protected species. 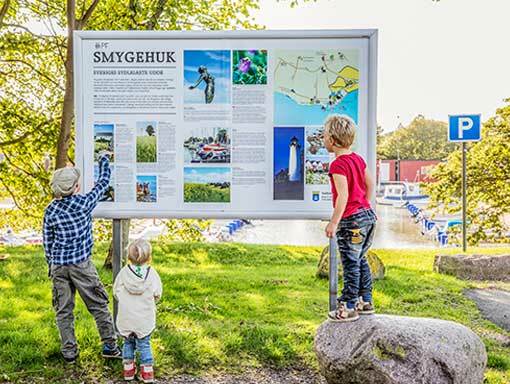 Smygehuk tourist information – Smygetorp is located in the harbor. Skånetrafikens bus nr. 190 stops in Smygehuk. A public toilet building is centrally located in the area. The toilets are free of charge and the building contains 4 wc and 1 HCP-WC. There is also the possibility of emptying latrine. The toilets are not open 24 hours a day. 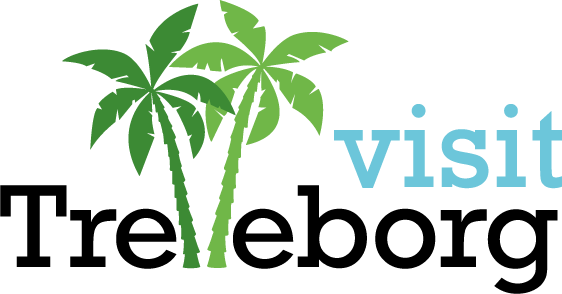 There are 5 different dining options in the area. Everything from smoked fish to ice cream. Parking at Smygehuk is very limited! These are your options if you want to leave your car at home. -Local bus ( yellow) line 190. -Bicycle road along the coastline.